Dentures are a great solution for missing or weak teeth. Dentures are removable dental prosthetics that imitate a partial or full set of teeth. While we place traditional dentures on the gums, there are also implant-supported dentures that we can attach to a base we place on the jawbone. This base is typically a titanium implant that holds the dentures in place. The type of dentures you end up with often depends on a number of factors like how many of your natural teeth are missing and what the integrity of your jawbone looks like. As the name implies, we can use these dentures to replace a full set of teeth. The device we use replaces a set of upper teeth by remaining in place thanks to the base that keeps it securely on the roof of the mouth and gums. While a full set of dentures works in a similar way, it is a horseshoe shape to avoid obstructing the tongue. Before installing a set of full dentures, your dentist will remove any remaining teeth. Partial dentures are a great solution if you are only missing a few teeth. We can attach partial dentures directly to the natural teeth using metal clasps. We may also recommend putting crowns on the natural teeth that we will need to use for support if there are signs of damage or decay. Implant-supported dentures are arguably the most effective way to deal with missing teeth. We attach implant-supported dentures to implants that we place in the jawbone. It may take a few visits to complete the process and ensure that everything works properly. However, it will be worth the wait. One of the main benefits of implant supported dentures is the fact they are more secure than other denture types. Traditional ones tend to slip out of place regardless of how well they fit. The two main types of implant-supported dentures are ball-retained and bar-retained dentures. We fix a thin metal bar to multiple implants in the jawbone for the latter. We then attach the denture to the bar using clips or something else along those lines. Ball-retained dentures come with sockets that lock into place on the ball-shaped outward facing end of the implant. We often reserve implant-supported dentures for patients with healthy jawbones, gums and an otherwise healthy mouth. Regardless of the type of dentures, you decide to go with, it is your responsibility to keep them in great condition. Thus, you should remove your dentures to clean them on a daily basis. You then need to place the dentures in a special solution overnight. We are happy to go through this process in greater detail during a meeting. You also still need to brush your mouth twice daily with a quality toothpaste. With so many types of dentures available nowadays, there is no need for you to feel embarrassed about missing teeth. Restoring your smile with dentures is a simple and straightforward process. Contact a dentist to find out more about these devices if you think you are a good candidate for one. 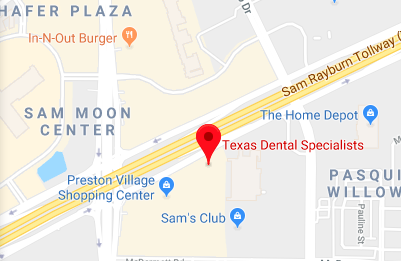 Request an appointment in our Plano dental office here: http://www.texasdentalspecialists.com. Call us at (214) 619-6329 for more information from Texas Dental Specialists. All the bones in the body require stimulation to maintain density, which is why load-bearing exercises promote healthy bones. The bones in the mouth are no different. They depend on the stimulation provided by the action of the teeth to maintain their density. Without stimulation, the bone begins to deteriorate. In other words, missing teeth can significantly contribute toward bone loss. Additionally, the teeth on either side of the gap lose some of their support and begin to lean toward the gap, which can lead to problems with one's bite. Crooked teeth tend to be much harder to clean and, therefore, can be susceptible to decay. Thanks to modern technology replacing these missing teeth with partial dentures that look, feel, and function like your natural teeth is a relatively simple procedure. There is little doubt that dentures today are far more natural looking and much more comfortable than those that older generations are wearing. Additionally, the fact that people can remove and clean them is often a plus. However, the fact remains that, contrary to what many people seem to believe, dentures are not made to last forever. The very fact that any dentures, be they partial or full, are removable, means that they can and do loosen over time. Nobody wants to worry perpetually about when their dentures are going to pop loose which, as we all know, is bound to happen at the most inopportune moments possible. Also, it is well to remember that dentures are supposed to have a tight seal and, when they loosen, food tends to collect under the denture that will, obviously, increase the risk of a bacterial infection. While there is no question that dentures wear down in time, it is more than likely that the reason behind them loosening is not that they have changed shape, but that the bones in the jaw have. As we age all our bones begin to shrink. While this may not be a significant problem with the rest of our body, partial dentures are made to fit so precisely, that any changes in the underlying bony ridge can cause uncomfortable changes in how they fit and feel. This is why we recommend that you have your dentures inspected at least annually and replaced every 5-6 years or so. Call (214) 619-6329 to schedule an appointment with Texas Dental Specialists in our Plano dental office. Dentures from Texas Dental Specialists are a form of dental replacements or false teeth that are created to replace any number of missing teeth. Dentures can be made to be fixed in place or to be removable. The placement of dentures will allow your dental structure to remain intact and to continue performing properly if you have lost several teeth. Our dentures are made of high-quality, strong, and attractive materials. Once your dentures are created and fitted, you will enjoy your new look and your renewed ability to chew and speak like you once did. Since every person's dental structure is different, your dentures will need to be manufactured and customized to your exact mouth shape and the measurements of the surrounding dental support structure. Your first visit to our office will include the measurement process and while you are here, we will also make an impression of your teeth and gums to be used in conjunction with the other materials to make your dentures. After your dental cast is created, it will be sent to a manufacturing lab where your dentures will be fabricated. When your set of dentures comes in, we will notify you so that you can come in for a fitting. At your fitting, we will have you try the dentures on and perform normal functions like speaking and biting down. If your dentures fit, you will be able to leave with them. If we have concerns about the fit, we will note them and have your dentures adjusted for a better fit. Once your dentures fit securely, if you have chosen a fixed set, we will cement them into place with strong dental glue. The most common problem is an initial lisp when you wear your dentures. The more often you wear your dentures and speak with them in place, the better your speech will become. It should not take long for you to get accustomed to your dentures and the lisp to fade. Sometimes people complain of irritation as they are becoming used to their dentures. An oral topical anesthetic like Orajel can help. If any irritation persists, let Texas Dental Specialists know so that we can reexamine the fit of your dentures. Your dentures will provide you with a solid biting surface for eating all the foods you enjoy. They will also allow you to maintain a sturdy dental structure that will not begin to shift, creating malformations and other problems. Your dentures will provide you with a new, attractive smile that will give you more confidence. Our dentures are a stable, durable product that allows you to enjoy your smile to the fullest extent. The denture creation and fitting process is simple and efficient, and it provides excellent results. Don't risk irreparable damage from not having your teeth replaced with a good substitute like dentures. Visit Texas Dental Specialists to learn more about this simple and necessary process. As a dentures dentist, we know that few people ever consider life after losing teeth. Even fewer considered life with dentures. In fact in a recent survey more than 60% of the responders stated that they had never even considered or given serious thought to dentures. Most people are confident about the quality and health of their teeth. With over 97% of people now brushing their teeth at least once per day, it is understandable why so many people feel like they will never lose a tooth. While avoiding tooth loss is a great goal to work towards, most adults will experience some tooth loss in their lifetime. For example, you might be surprised to learn that around 20 million women, over the age of 40, wear dentures in the United States today. According to the Journal of Prosthetic Dentistry, the number of people that will be wearing complete dentures will be around 37.9 million by 2020. While we strongly encourage all of our patients to take good care of their teeth, be careful what they bite down on and have a healthier diet, we also know that sometimes DNA or age just catches up with you. Nobody suddenly needs dentures one morning. You will, almost, never wake up one morning with a gaping hole in your teeth and needing to come see the dentist for dentures. Instead, the way it usually works is that there are underlying symptoms, which people tend to ignore. Your body will tell you if you have an infection or gum disease, and give you the opportunity to come see us and have us fix the problem before it leads to tooth loss. Naturally the best way to avoid ever getting to that place is to be part of the 53% of Americans that make it a habit to visit the dentist at least twice each year. When you do this, we have an opportunity to catch any underlying problems before they fester too long and become severe. In between appointments, or if you are part of the 48% that doesn't visit us regularly, there are a few signs to look for that may indicate an infection or diseases that require medical attention. One of the most common, and often ignored, signs of gum disease is a loosening of teeth. Your teeth were never meant to be loose and when they start to shift inside your mouth of their own accord, this is an indicator of a deeper problem. Another indicator of gum disease is a toothache. While people do get toothaches from eating too much sweet, if you cannot control the toothache with over the counter medication, if it lasts longer than a day or two, or if it comes back frequently this could be an indicator of a deeper infection or gum disease. Since gum disease is a leading cause of tooth loss, these symptoms require immediate dental care. While we will try to prevent tooth loss, if you do lose a tooth - we can help. We can create a comfortable set of dentures that will look natural and function perfectly, allowing you to smile with confidence. Dentures are a removable appliance used to fill the gaps where you have lost teeth. They are a viable option to consider for those who do not want to go through the long procedure that is required for the more permanent options. Like mentioned above, dentures are removable oral appliances that replace missing teeth. They are custom-created to fit your gums and mouth securely. They look realistic and feel life-like in your mouth. Dentures are comfortable to wear. Dentures can be partial, which means they fit a mouth that has some remaining teeth. Dentures can also be complete, which means they fit a mouth with no remaining teeth. Dentures can help your dental structure keep its shape and give you beautiful teeth. You will visit our office for a few appointments to get dentures. The process will consist of us examining your gums and any remaining teeth, making a mold of your mouth, and sending the mold off for the creation of your dentures. Once your dentures are ready, you will come in for a fitting to ensure your dentures fit correctly and do not slide around in your mouth. What are the benefits of dentures? Dentures improve the aesthetic value of your mouth, and they help eating, speaking and smiling performance. If you have remaining teeth, the dentures will protect them from excessive wear due to uneven distribution of pressure. They will also keep your face from looking “sunken in.” They are the most affordable teeth replacement option. How are my dentures kept in place? Upper complete dentures stay in place naturally because of the suction that occurs between them and the roof of your mouth. Lower complete dentures are secured in place by your tongue muscles and lips. Partial dentures are held in place by clasps or crowns that attach to any remaining teeth you have. Denture adhesives are also available to help hold dentures in place as needed. Dental bridges and dental implants are the most common alternatives to dentures. Both options are more permanently fixed in your mouth. Both of these options require healthy teeth and gums. They are also more expensive than dentures and take longer to apply to your dental structure. How long will dentures last? Dentures should last for 5-10 years. They will need to be replaced because with everyday wear, they often become warped. They can also wear down because of biting forces and become less effective in some circumstances. Sometimes dentures will become looser with time which is an indicator that they need to be replaced. We will replace or repair your dentures to maintain their realistic appearance and feel. If you need teeth replacements, dentures are a good option for most people. It is easy to be a candidate for dentures which makes them more desirable for patients. They are simple to create and apply, and offer the chewing and speaking functions you have been missing.